Very easy to use & install NMEA combiner & multiplexer. Ideal if you want to combine multiple NMEA 0183 devices with equipment like phones, chart plotters, PCs, laptops and tablets. And then view your marine data wirelessly anywhere on your boat. Combines 1 SeaTalk* and 3 NMEA inputs into 1 wired NMEA or wirelessly output. The ideal way to consolidate all your marine data. NMEA Combiner / Multiplexer for small-commercial, leisure, sailing, pleasure and fishing boats. 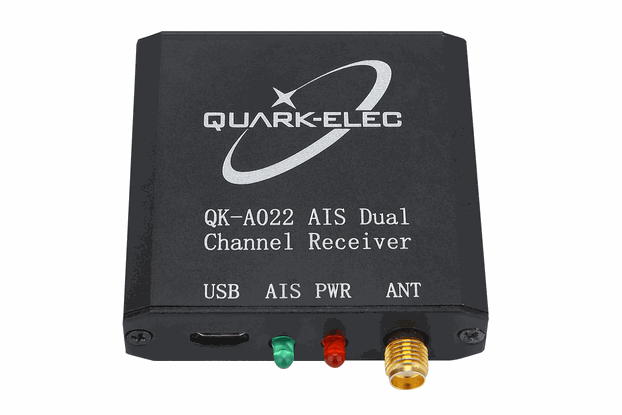 The QK-A031 is a very sophisticated NMEA 0183 multiplexer & combiner that has three NMEA 0183 inputs (listener-ports), one SeaTalk1 input, one NMEA 0813 output (talker-port), a WiFi interface and a USB port to connect to host devices. The built-in SeaTalk™ to NMEA converter translates SeaTalk data into NMEA sentences. This data is then combined with NMEA data received on the other inputs. SeaTalk is converted into NMEA sentences but not vice-versa. The SeaTalk bus is a single-cable system and connects all instruments serially. Only one SeaTalk input is needed. A effective way to view all your marine data combined wirelessly anywhere on your boat to your mobile phones, tablet and laptop (with the added option to connect to a NMEA chart plotter). Multiplex up to three NMEA 0183 input devices. Galvanically isolated NMEA and SeaTalk input ports. Configurable baud rates: (4.8, 9.6, 38.4k input and output). Simultaneous wireless and USB output. The internal WiFi access point connects up to 4 devices simultaneously. Wide power supply voltage: DC 9-35 Volts. The NMEA Combiner / Multiplexer is ideal for all small-commercial, leisure, sailing, pleasure and fishing boats. WiFi Interface. The wireless connection can always be checked with TCP/IP port monitoring software as shown in the application notes and the SSID and password can be changed through QK-A031 configuration APP, increasing security and memorability. QK-A031 can connect in Ad Hoc (peer-peer mode) or Station Mode (through a router) by selecting the mode and specifying the SSID and Password. LED lights. Which indicate power (8), NMEA In (2,3,4) NMEA out (5) and SeaTalk (1) status respectively. Will you need a Garmin Bridge ? A garmin bridge is easy to install using a simple ‘Plug ‘n’ Play’ connection with no setup or configuration needed. You will probably need one if you are connecting to a Garmin Device or some Raymarine Products. The easy way to check is to have a look at the device output connections you will be connecting the multiplexer to. You will need a garmin bridge if the connections on the device (Chart plotter, depth reader, etc.) have a TX, RX or GND connection. Quark-elec order number is QK-A031. In the package, you will have: QK-A031 module with enclosure and one USB cable.